Angel Dorei Museum presents A Celebration of Women – An exhibition of works by some of the most talented women artists in SL. This show is presented in support of The Making Stides Group /ACS – breast cancer awareness, education. The Exhibition will run thu the month of February. Please join us and celebrate, Art, Talent, Hope and Life. Supporting the American Cancer Society’s unique mission to fight cancer on four fronts: research, education, advocacy, and patient services. As the nation’s largest nongovernmental breast cancer research supporter, the American Cancer Society has invested more than $290 million since 1972 to give those touched by breast cancer more reasons for hope. When you get involved in Making Strides, you help ensure progress against breast cancer continues… saving lives! Please contact Synergy Devonshire for more information. 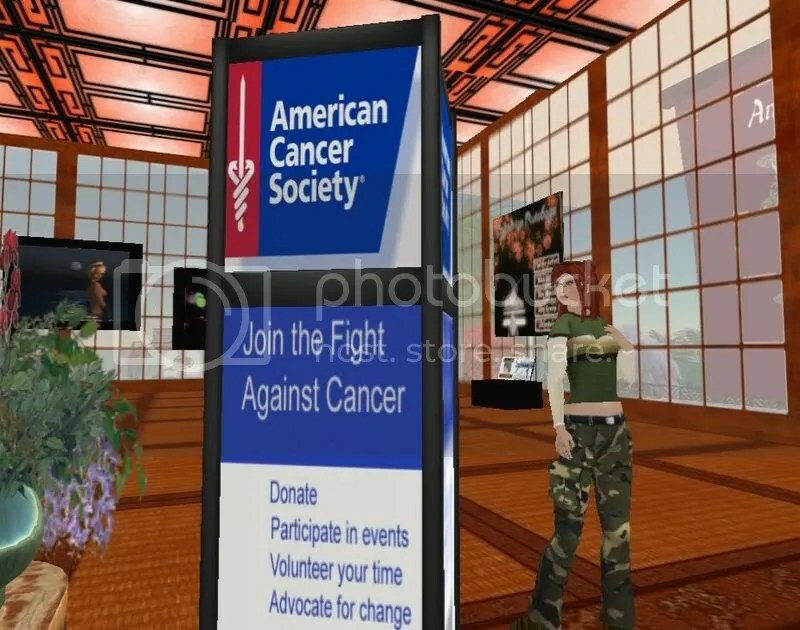 Donation kiosks and gift bags with more information available at Angel Dorei. Today a long time fan of SL Live Music, Reginald Beck, is having a Rezz Day party. The line up is GREAT! Yippee…now…if I could just remember the location. I’ll be playing at 11amSLT/2pmEST. Big Line up…Cylindrian 11amSLT, Juel Resistance 12pmSLT, Foxyflwr Cure 1pmSLT and MORE!!! Thank you for all the pictures!!! Check the right side of the blog site to link to the Flickr Site and join the Group and get posting and commenting…its FUN! THANKS so much again to Crap Mariner for setting it up for me. Please Don’t Forget to Create a Free Listener Account, Listen and Bump Grace’s and other musicians music on TheSixtyOne! Musicians…get your music posted and let me know your links!! This site is really cool and I’ve discovered some incredible artists! ThSixtyOne is a site that musicians use to gain more listeners and feedback about their songs. I have a number of originals and covers posted on this site. All you have to do to participate is go to my site and generate a Listener Account. You earn points by “bumping” artists. Each day you log in, you get points…each artist you bump that receives more bumps, you get points….I have discovered some amazing music using this site. Just don’t forget to keep going back and bumping. I need continued support. If there’s a song I’ve done that just jumps out and grabs ya’, keep bumping it. This way it stays up in the ranks and others get exposed to it. Thank you so much for listening and I hope you ENJOY this new way of listening to music. Crap was kind enough to create a group on Flickr for posting photos from my past two years in SL. He’s posted some funny photo’s and Claudia Mantis has added some of her beautifully edited pictures. I have a lot of you who send photo’s to me in Second Life sort of chronicaling our adventures throughout the virtual world. I have played so many places over the past two years. I recently celebrated my 2nd Rezz Day (that’s the day I first created my avatar for those of you reading this who have no idea what a “rezz day” is). Apparently, Jan 29th was my 2nd Rezz Day. The day went with no mention, no attention, no fanfare…in fact…I totally forgot…until yesterday. ahahhaha. I was looking at my SL Profile for something and saw it…and thought…hmmm…two years sure have passed by fast. Then I proceeded to go through my inventory trying to find photos from my SL Past and Present for that matter. Folks, you must understand something about me…I am as organized as chaotic anarchy. There is no way that I can find and post all the photos that I have in my inventory. 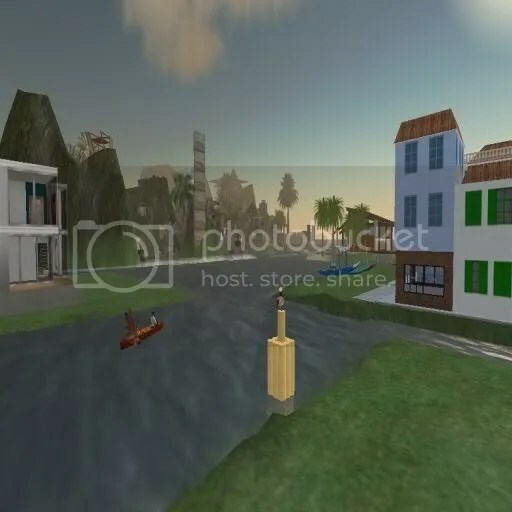 I wanted to add a post in my blog here for you all to post your photos of where you have seen my avatar inworld and write a short little blurb about it. Where was it? When was it? What do you remember about the concerts? I want your feedback and your participation. Because, it’ll be fun to see the varying faces, costumes, people, sites, and stuff like that. I really hope you readers take part in this. 🙂 I’ll beg if I have too. I’m going to start by digging up one of my oldest pictures and lets see what I can remember about it…I’ll post it and write a blurb…and lets see what y’all come up with too. 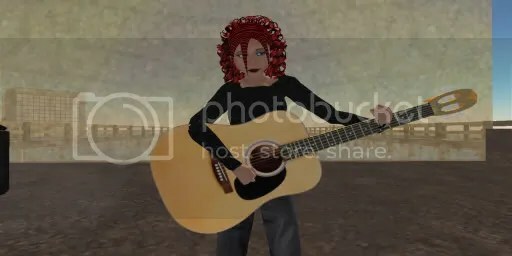 Here I am at one of my first gigs in SL…At a place called: The Gathering. It is here where I met Frogg Marlowe and Jaycatt Nico and got all set up gigging thanks to Wisper Amos, Circe Broom, Frogg/Jaycatt…I came into SL because of Neil Morrison, Russel Eponym, and Mel Cheeky…we were among the first musicians to migrate to SL from the PalTalk Open Mic Chat Rooms. 🙂 Jan 2006. Here r some recent pics. Need to check my backup for older ones. Heres the first on me flickr page. Can’t remember where it is. Havent been there for a long while. Check out the hair…I modified it somehow and made it all striped…my hands are also kinda big…and the skin was a freebie I picked up somewhere too. I also believe I was about 8 ft tall too. AND…I obviously didn’t know how to adjust my guitar!! !